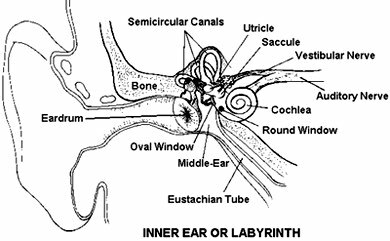 The inner ear is part of the vertebrate ear which contains the organs of hearing and balance (see vestibular sense). The inner ear is surrounded by the temporal bone of the skull and is connected to the brain by the auditory nerve. It consists of two connected chambers with sensory walls. From one, the utricle, arise the semicircular canals, which are concerned with balance. From the other, the sacculus, arises the cochlea. The whole inner ear is filled with a fluid (endolymph) and is separated from the surrounding skull wall by another fluid (perilymph).